For those who haven’t heard the news, tonight is the last night for the clubs at Walt Disney World’s Pleasure Island. Even though last ditch attempts have been made by fans of venues like the Adventurer’s Club, Disney says they have plans for the space currently occupied by the clubs which include more dining and shopping options. The Rock’n’Roll Beach Club was closed in February, but tonight is the last hurrah for Mannequins, 8-Trax, BET Sound Stage, Motion, the Comedy Warehouse and the Adventurer’s Club. To celebrate, PI is bringing back Frankie and the West End Boys for one last night to play the waterfront stage (since the West End stage was replaced several months ago by the new pedestrian bridge to the West Side of Downtown Disney). They will play four 45-minute sets at 7:30pm, 8:45pm, 10pm, and 11:15pm. The Adventurer’s Club will also open early at 6pm with additional Library shows, as will the Comedy Warehouse with shows at 6:55pm, 8pm, 9:10pm, 10:25pm, 11:35pm and 12:45am. It’s free to be on PI, so you can enjoy the waterfront and DJ entertainment outside. Individual club admission is $10 (plus tax) with a multi-club pass costing $20 (plus tax). Annual PI passes will still be valid this last night, too, and holders can then request a pro-rated refund for the balance. Or you can use that pass and trade it in for a special Universal Orlando CityWalk party pass good until next March. Even though I haven’t been to PI much in recent years, it’s still sad to see Disney close it all down. When I first moved to Orlando thirteen years ago, I knew nobody and many of the friends I have today are ones I made by going out to PI the first few years I lived here. I also have many good memories of celebrating birthdays and other special occasions with friends there. So, I think I’m gonna head out to say goodbye and maybe take some photos. Will I see any of you out there? So those who have bank accounts with Washington Mutual – aka “WaMu” – woke up this morning to find out their bank had gone under and was bought up by JPMorgan Chase for $1.9 billion. Reportedly JPMorgan Chase won’t close many Florida branches because they view us as a growth market, but accounts will be transitioned over to the new ownership, which means in coming months, customers can expect everything to be rebranded and most likely anyone with an ATM, debit or credit card issued by WaMu will be issued a new card during the process. But for now, the new owners say everything from account numbers to customer access to their accounts will remain the same. Thankfully I don’t have an account with them, but I can’t imagine a scarier feeling than to wake up and find your bank isn’t your bank anymore. If you have a WaMu account, what are your feelings on this sudden change? For who look forward to those fall fests at the area theme parks, two of the biggies start today. Epcot’s Food & Wine Fest starts today. It’s the 13th year of the festival which offers up samples of food and drink from around the world, and this year’s focus is on “culinary cities,” along with the state of Louisiana. You do need to buy a park admission or have an annual pass of some kind for Walt Disney World, but once inside, you can stroll the World Showcase in the back of the park and try food and drink native to countries and cities from around the world. Average samples will set you back $2 to $5 per item, so it’s an inexpensive way to try something you’ve never had before. There’s also free seminars daily, which usually offer up samples (though the lines can be very long to get in to one, especially on weekends), and free nightly entertainment from nationally-known entertainers. This year’s fest kicks off with the sounds of ska-swing band Big Bad Voodoo Daddy tonight and tomorrow (Saturday) and continues over the weekend with Sheena Easton on Sunday, Monday and Tuesday. For more info, visit the official Walt Disney World Food & Wine website. For those that would rather be scared than wined and dined, Universal Orlando’s Halloween Horror Nights also starts tonight. It’s the 18th incarnation of the annual event and this year’s theme is Urban Legends, Fairy Tales & Myths, epitomized by the legend of Bloody Mary, who comes to life if you chant her name into a mirror. Universal says over 300 new characters were created for this year’s event, which runs September 26-27, October 2-5, 9-12, 16-19, 22-26 and October 29-November 1. Separate park admission is required for Halloween Horror Nights, even if you have a Universal Orlando annual pass, but special Florida-resident discounts and multi-night passes are available. The event’s official website has all the details. Are you planning to go to one or both? Do you prefer one over the other? Let us know in comments. LET THE CELEBRATION BEGIN: In a New York City ballroom on Sept. 18, 2008, Disney Parks and Resorts chairman Jay Rasulo (pictured) announced that Disney Parks will welcome guests in 2009 with free theme park admission on their birthday. In a stroke of genius that in hindsight makes me wonder, why haven’t they done this before, Disney announced they will be offering free admission for people on their birthday in 2009. What a great way to get people out to the park, especially locally. Hitting the parks on your “special day” is always on the list of possible activities for most any local resident, and this move probably just made up hundreds of thousands of people’s minds for what to do next year. No one goes to the park without dropping some cash on food and merchandise and likely won’t go alone. Further, they created a special reason to pull the trigger for tons of people on a rotating schedule every day of the calendar next year! That’s genius! Give the guy that got that idea off the ground over there a raise. As you know from earlier posts, I had plans to attend this weekend’s IZEAFest and I did, even though I can’t claim to be too awake during the morning sessions. LOL But overall, I’d have to say I thoroughly enjoyed the conference. To be honest, I didn’t learn a lot of new stuff, since I’ve been blogging and designing for over eight years, but I enjoyed hearing the different perspectives from the people on the panels. I also felt quite a bit more inspired to keep doing this line of work in hearing the anecdotes and various tidbits of info that I didn’t know. Think of it as positive reinforcement that I’m still on the right track. Though in talking with others, some got a wealth of new knowledge from the panels, so I guess it’s all relative to what you walked in there knowing. 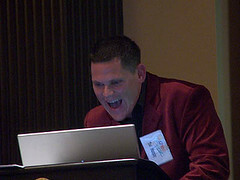 But what I did enjoy the most were the various networking opportunities this blogger conference gave me. From people who I read daily to people who I’ve now added to my feedreader, it was the human interaction with people who felt as passionate about the subject as me that I enjoyed the most. And I really enjoyed finally meeting people face to face that I’d only interacted with online before (a big hello to Ashley, Sean B. & Rae!). First of all, big kudos to the IZEA folks who put on the conference. Despite a few glitches (which happen at any conference), both days ran smooth and provided a good variety of panels, for people of all levels of blogging. Though, in talking with people in between, as well as hearing various panel guests talk about “hotlinking” (a word that seriously makes me cringe), perhaps a “copyrights and blogging” panel might be a good subject for any future events. 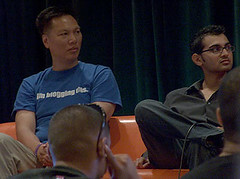 Second, if you didn’t attend, or just want to relive the event, IZEA is streaming the event at izeafest.com/live.html. You can also read the Twitter stream that ran during the event, which I’d have to say was really cool to experience in the moment, as it was interesting reading the various threads that were running between those in the room and those who were not even in Orlando, much less at the event, but were following the live feed on their computers. A great way to harness current social media technology, I think. If anyone is interested, I have a few pics up from the event at my Flickr account. Lighting wasn’t the best from the back, where I was sitting, and the light from the onstage screens, while providing several ongoing streams of chat to read, played havoc with my camera’s light meter. As a result, I stopped taking pictures on the second day. 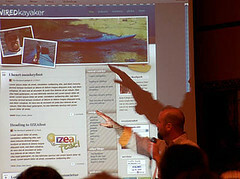 But thanks to Flickr’s search engine, you can also view pics there from anyone else who tagged their photos with IZEAFest. I look forward to seeing what the IZEA folks put together for their next event, and I’m really looking forward to seeing more about the new project from them, which they debuted on Friday at the conference. I’ll talk more about it when it gets to a stage where it’s out of the testing phase and open to all, but I think it’ll provide a really fun level of interactivity to any blog and I’m excited that it’s being produced by an Orlando-based company. So, that’s my wrap-up on IZEAFest. Did you go or at least watch the live feed? I’d love to hear your thoughts on it and if you’ve done a blog post or have photos up somewhere, drop a link in the comments so we can come read it. I’m one of those who views a good beer like a good wine, especially when paired with the right food dish. If you feel the same, you might be interested in Thursday’s Beer Tasting Dinner at the Copper Rocket. The evening will be a 4-course dinner, consisting of shark bites & shrimp for the appetizer, a hearts of palm salad, an entree of glazed pork shank on a bed of gruyere spaetzle, ending with a chocolate milk stout cake covered in raspberry drizzle for dessert. Each course will be accompanied by a beer chosen by Florida Micro Beverage, which I’m guessing is co-sponsoring this event. Tickets are $30 per person and, according to the flyer, they’re capping attendance at 30 guests. The event takes place September 18th from 7pm to 9:30pm and you can find more information online at the Copper Rocket’s MySpace page. I know that Michelle already mentioned this before, but since I’m flying to town for it I thought I’d mention it again – IZEAfest is this week! If you are interested in blogs or social media or anything that kinda relates to that I’m guessing you might want to check it out. There’s lots of great speakers lined up which you can see from this schedule. I’m even on a panel Saturday about social networking if that’s your thing. Anyway, come out, say hi, all that stuff. See you then! Most people don’t need any additional incentives to go see a movie at the Enzian. Comfortable seats, great food and drinks, along with an eclectic list of films is usually enough. But I’ve discovered there is a promotion running, in conjunction with the Orlando Visitor’s Bureau, called “Endless Summer” that will get you two movie tickets for the price of one at the Enzian. Yeah, you read that right. Two tickets for the price of one. The deal runs through November 15th and you simply need to use the promotion code “08CVBESUM” when buying your tickets. A list of current and upcoming films, along with a full dining and drink menu, can be found online at The Enzian website. The Enzian is located at 1300 South Orlando Avenue in Maitland.